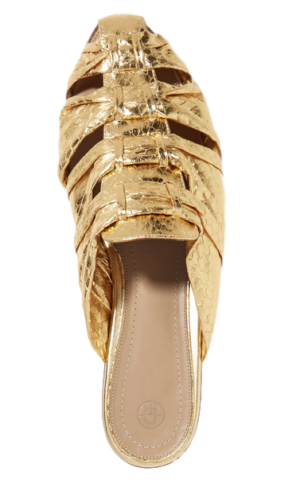 I rarely dedicate a blog post to just one item but I am doing it for this shoe because it is an exception. THE ROW Capri Metallic Snakeskin Slide is the best shoe I’ve seen in a long time! This slide is for women who want to look chic and can’t (or don’t want to) wear heels. Wear it to a casual beachy dinner in St. Barts or a city cocktail party. If you’re going to buy only one pair of shoes this year, make it this one!